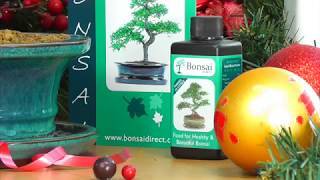 Buy the Comprehensive Christmas Chinese Elm Bonsai Gift Set from Bonsai Direct. With free delivery to most areas & care instructions included. We deliver 7 days a week. A great Christmas gift set featuring the wonderful S-Shaped Chinese Elm bonsai, ideal for beginners. A fast growing bonsai which is fun to prune and style. This lovely gift comes complete with drip tray, pruning scissors, bosnai tree feed, bonsai care handbook and Merry christmas balloon.